Funding of £500,000 will go to summer holiday school lunch and fun clubs, the Welsh education secretary has said. The money will be offered to councils in the most deprived parts of Wales to help provide play schemes and meals over the long break. Kirsty Williams said there would be elements of education in the clubs and Welsh universities would be involved. "These clubs will offer a positive environment for all our children during the summer holidays," she said. The Welsh Liberal Democrat AM added: "The reality is for some of our young people the school summer holidays can be a difficult time. "Children who benefit from free school breakfasts and lunches often miss meals and go hungry once their school closes for the holidays, while the lack of free play schemes and sports activities can have an impact on those from the most disadvantaged backgrounds." Five local authorities in Wales already run similar schemes and the Welsh Government said councils would be able to access funding for new ventures in the 2017-18 financial year. The cash will be distributed in conjunction with the Welsh Local Government Association, with further details announced later in the year. Katie Palmer, Sustainable Food Cities co-ordinator for Food Cardiff, described it as "an important step in tackling health inequalities". "We are thrilled with this news. Last summer, Food Cardiff worked with the Welsh Local Government Association to develop the Food and Fun model across Wales, in partnership with local councils and health boards," she said. "The model, based on our pilot in Cardiff during summer 2015, delivered free school meals, food education and fun physical activities to children during the school break." Fiona Kinghorn, interim director of Public Health for Cardiff and Vale University Health Board, one of Food Cardiff's partners, also welcomed the announcement. "Some children experience inadequate nutrition during the school holidays and there is also the potential for loss of learning and social isolation," she said. "We have long recognised that addressing these issues requires a collaborative, coordinated response at local level, underpinned by national policy. "Therefore we welcome this news from Welsh Government, which sees a commitment to deliver support where it is most needed." 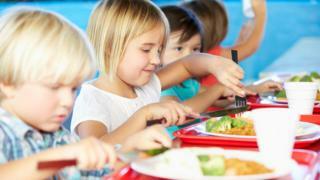 Video Do children go hungry in the school holidays?